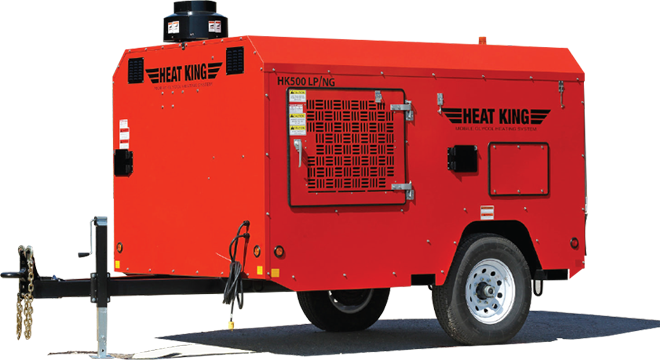 The HK300, the midsize heater of the Heat King family, is now available in LP/NG. This unit is designed for any contractor. Quiet, compact and efficient, yet powerful enough to thaw ground, cure concrete or provide temporary heat for up to four new home sites at once. The HK 300 is now available in Propane and Natural Gas set-ups. These clean burning fuels are even more reliable than the legendary oil fired Heat King systems. Because of their quiet operation they are perfectly suited for residential applications. For even more versatility the burner assemblies can be quickly changed from one to the other.